The meeting had a good participation with activists from many countries (Belgium, Greece, France, Germany, Italy, Netherlands, Spain, Austria, Croatia) and from different networks and organizations (trade unions, parties, associations, social centers, collectives) with a wealth of political and strategic discussion. We began with an overview of the history of the Blockupy process, highlighting some characteristics that it had during its development. It started from a German situation and was based on a strong territorial commitment but at the same time also found a transnational dimension. It had a midterm perspective with central moments of common action in the streets at “speaking” (symbolic) targets. Blockupy is not a formal alliance but functions more like a “hybrid thing” between active members of networks and organizations committed to launch the process within and outside their networks. Moreover, it functioned in a specific historical situation enabling European “anti-austerity moments” of movement building and articulation. It seems clear that after March 18 in Frankfurt, Blockupy is now at a crossroad: the old phase, linked to the opening of the ECB and the intense Greek struggles is over; the new phase needs to be deployed and pushed. In the last Blockupy International meeting in Padua in July we agreed to strengthen Blockupy and anti-austerity struggles, moving from Frankfurt’s financial center to one of the headquarters of political decision in Europe such as Berlin or Brussels. We pointed out that Brussels in mid-October with its EU council summit should be a first milestone; a next milestone in spring 2016, possibly in Berlin, should follow. 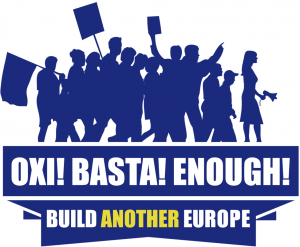 We also proposed a “Europeanization of the OXI” as spirit of both refusal of austerity and dignity for all – as a campaign taken up everywhere and by everyone (https://blockupy.org/en/6184/report-on-the-meeting-of-blockupyinternational-coordinating-group-taking-a-new-step/). However, after July 13 dynamics in Europe changed. On the one hand, we had to witness the intense pressure and blackmail on the Greek government by the EU governments and institutions to sign a new memorandum with a wave of protest and intense frustration to follow. On the other hand, we also saw an overwhelming pressure by refugees and migrants, as well as the people in Europe supporting them, on the European border regime that put “borders in crisis”. These changes in Europe force us to rethink our strategy – the implications of the summer in these different regards and in its consequences for the way to act upon it. Some points from the discussion seem to be crucial: The OXI is still an inspiring experience of the power of the people against the ruling elites, but now we need to define better our target and antagonism. The “Greek affair” shows us that elections can pose in question the crisis regime on the territorial level and politicize the “debt question” but they cannot defeat the power relations within the EU and the financial power of the crisis. It clarified also that, with regards to the crisis management as well as any relevant issue on the European level, it is the political decisions taken by the political actors in the framework of the current power relations on the European level (and not “technical solutions adopted by independent institutions” as they are sometimes portrayed). There are contradictions within the European Union; however, the discussions helped us also to highlight the political aim of neo-liberal élites: to destroy any alternative. It is apparent right now, progressive and left forces in Europe seem to be rather “depressed” and fragmented than united and outraged by the events of the “summer”. Simultaneously, refugees, migrants and people throughout Europe have pushed another crisis and new political relations to the fore, exposing (other) fundamental contradictions within the EU. While in the latter case, we had a dynamic pushing against the border regime from inside and outside Europe, in the first case, the European dynamic diminished. Nevertheless, both contested the very constitution of Europe as EU. One of the major conclusions of this meeting was that it is still necessary to have a European space of action and mobilization: without people in march we cannot change things. We as Blockupy have used a specific political approach (transnational, targeting, confrontational, hybrid) and can develop our tactics against the power bloc of austerity policies. The necessity to improve connections between trans/national struggles is clear. Furthermore, our approach must allow local and European struggles to be linked and to be expressed in the “heart of the beast”. Thus, Blockupy’s main task will be to construct a counter-power through a space of transnational mobilization that is linked to local and territorial struggles. Blockupy’s success resulted from its ability to strategically set targets and to produce interventions thanks to strong discourses, strong actions and an intelligible symbolic target against the austerity regime. How to recreate this successful situation? For all strategizing, it remains crucial to combine the work on the political contradictions in the EU regime with the creation of a counter-power bloc that helps to change social majorities. Given the crucial role of political decision in this phase, we still reflected on Berlin as symbolic site that could be a next important step to make visible that counter bloc. Plus, there should be enough targets there for articulating this antagonism in a meaningful way. Berlin is one of the places where the centralization of power is taking place. Here (as elsewhere) the question of democracy and solidarity could be posed and become the center of this new shared message linked to a common struggle ground (public + private debt, narrative of “deficit-budget”, welfare/social rights, speculation etc.). However, how to frame “Berlin” needs to be considered carefully and seriously, so that it would not be framed in “nationalist” (Anti-German) terms. Furthermore, setting a target and deciding on a “territory” cannot be a “transnational” decision alone. Such a target can only be successful if it becomes a campaign in the territories and is taken up as one’s campaign. Once we define better this mid-term target, we could have a frame that can intertwine with other processes, events and mobilizations; in particular, we mentioned the Cop21 mobilization in Paris as well as the migrant strike of March 1st proposed during last Transnational Strike Meeting in Poznan. We decided to speak more thoroughly about these dates in our next phone calls. Moreover, Dyktio is thinking of a transnational festival in February/March in Athens to bring together transnational and local movements in order to work against the “Europeanization of TINA”. However, Blockupy (as our network) is also about trusting people/networks in organizing this process, mobilizing from the “region” itself is crucial too; thus the relationship between the transnational processes and commitments and the territorial base as crucial space of “own” mobilization remains critical. This is valid also for Berlin. That is why it is crucial to take into consideration the next meeting/conference of Blockupy that was planned for November and is now planned for early February in Berlin (Feb. 6./7.). Here, intense, deep and enlarged discussions are planned for the Blockupy alliance and its friends in order to understand and push a possible dynamic within Germany. Apart from the necessary discussion for the movements in Germany it could be a place for a discussion about the necessary link between local and transnational mobilizations: what would be the conditions for a transnational and territorial successful mobilization, which commitments are required, how to understand the respective needs and possibilities to re-create that dynamics of action that permitted us to work in last three years. However, it needs to be prepared in a way that “both discussions” take place in their own right and with productive linkages. These meetings cannot be the all encompassing weekends of all planning and decision making; however, we need to find and define the space in which we can go a step forward and work out agreements on how to go on. Yet, Blockupy International can and will continue with its crucial transnational political work and remain a space that draws other networks, regions, activists in the European space; however, only if it does not restrict itself to Berlin/Germany or the decision making processes of “events” (no matter how important). Blockupy International as a political space needs to engage much more in common political discussions on strategies within, against, and for the European space. What does it mean for progressive anti-austerity movements and political actors to continue with our work, what are the conditions to create an oppositional bloc, how do we exchange the uneven conditions for these kinds of politics. Therefore, there is the utmost necessity for our own and the political process to find new ways to engage again actively and participate in the organizing process of Blockupy International, sharing responsibilities also through the involvement of new subjects who came in the aftermath of March 18.